Meeting customer expectations is increasingly important for organisations in a digital world. It would be an understatement to say that social media has transformed the way we connect with our friends and family. What did we do before the days of cat videos and Game of Thrones’ memes? According to research by Mediakix, the average person will spend five years and four months on social media in their lifetime. That’s a whole lot of scrolling. But it’s not just our personal lives where social channels have become a part of our daily routine. Our recent SalesTech report surveyed businesses in the UK and US and found that more than half (53%) of sales reps choose Facebook as their research tool of choice when it comes to preparing for meetings with prospects. And this a trend happening both sides of the Atlantic, with 60 per cent of the American respondents turning to Facebook, compared to 46 per cent of Brits. It’s clear that sales employees are increasingly turning to social media channels to help them build a picture of potential clients. Of course there’s a fine line to tread between knowing enough information that it will benefit the relationship with the prospect, and bordering on intrusion. So how is social media being used, and how can employees ensure this is being done in a positive way? 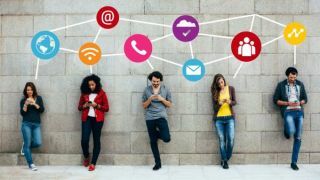 Beyond traditional networking tools, social media has increasingly become a part of everyday working life for these professionals. Our report found that 72 per cent are spending 30 minutes or more using the channels to research, whilst nearly half (49%) spend at least 45 minutes preparing. Beyond Facebook, the more business-focused network LinkedIn tops the list as the preferred platform for meeting preparation (64%), followed by the company website (63%) and Google (61%). A third (34%) are also turning to Twitter to gain insight into their prospects’ likes and interests. There is a wealth of information available on these channels: our likes, dislikes, what we’re reading and sharing and the companies and people that inspire us. So it’s understandable that sales reps have turned to these tools to help them get to know their clients both before that important first meeting, and on an ongoing basis. Our research also showed how different age group demographics are embracing social media. Millennial employees (aged between 18 – 34,) raised during the ascent of social media, are more likely to use both Facebook (59%) and Twitter (41%). In contrast, their older counterparts (55+ years) turn to LinkedIn (76%) and the company website (83%) more frequently. It’s interesting to note how multi-channel the approach of sales reps has become, enabled by the technological advances in recent years which has brought a range of channels and devices into our lives. The life of a sales rep is driven by research, preparation, maintaining existing customer relationships and keeping a permanent eye out for new potential prospects to engage with. This means it’s crucial that they have the important information to hand to help them to build positive bonds with their customers or clients from the very beginning. This is especially important when today’s customers are discerning, savvy and know they have the power when it comes to selecting a provider or brand to work with. A survey by Gartner found that 89 per cent of companies now expect to compete on the basis of customer experience, compared to 36 per cent in 2012. With the success of a sales rep based on the strength and value of the relationships they form with their customers, it’s vital that they can prove they’ve done their homework, and have the insight to be able to offer tailored solutions and services available to meet their needs. Whilst social media and digital tech has undoubtedly brought many benefits to both our personal and professional lives, it’s also generated a culture of immediacy that can be hard to keep up with. On the business side, the 24/7 accessibility of these channels means customers can make contact with a company at any time – in both a positive and negative way. Today’s customers are empowered and are quick to turn to Twitter to voice their concerns if they’ve had a bad experience, so ongoing monitoring of social channels and resolving issues before they escalate should be a part of any business’ strategy. According to research by Lithium Technologies, after making a complaint about a company on Twitter, 72 per cent of customers expect a response from them within one hour. Not meeting this deadline can damage the relationship; with 38 per cent of respondents saying they would feel more negative about the brand if the response isn’t quickly enough. Indeed, our survey revealed businesses are feeling the pressure of keeping customers satisfied in the instantaneous, fast-paced world of social media. Two thirds of businesses (64%) were concerned about customers’ expectations over speed, and 65 per cent expressed reservations about heightened demand for personalization. But the time spent manually researching could be used more efficiently, and Relationship Intelligence technology can do this automatically and present all the information in one place. For example, we recently launched Sugar Hint which does the work for employees, by gathering and analyzing customer intelligence from a broad range of social data sources so users can quickly and efficiently learn more about their prospects to establish a productive relationship. nal meeting. To make sure the interactions are both tactful and beneficial to the relationship, sales reps need access to the best technology and systems possible to help them aggregate all the information they need on from multiple sources, to ensure they make the best impression from the very start. For example, we recently launched Sugar Hint which does the work for employees, by gathering and analyzing customer intelligence from a broad range of social data sources so users can quickly and efficiently learn more about their prospects to establish a productive relationship. It’s understandable that social media has become an intrinsic part of customer-facing businesses when you consider how customers engage with these channels every day. The balance that sales reps need to strike is using this insight to build and nurture customer relationships, to prove to the customer they are valued and understood.